A woman's reproductive system is complex and plays an important role in her health and well-being. Uterus is a vital organ in a woman’s body. It is probably the most amazing organs in the female body. It plays a major role in a woman’s reproductive physiology and it needs special care and attention. But, most of us forget about the uterus or the womb that plays the key role in pregnancy. The uterus is considered to be the home for a developing baby. It is the vessel that holds the developing fetus till it matures into a baby and is ready for birth. So, improving and maintaining proper uterine health is essential for a woman’s fertility, implantation and conception. However, many a time, proper functioning of uterus is hindered due to different factors, like uterine fibroids, sedentary lifestyle, endometriosis, scar tissue, and hormonal imbalance. Tipped uterus is another cause for improper functioning and poor health of the uterus. One of the main causes of poor uterine health is thin endometrial lining. A thin uterine lining is a signal the uterus is not functioning properly. Over time this weakens the uterus. Thin endometrial lining prevents proper implantation and growth of the fetus and may lead to miscarriage. It also leads to irregular menstrual cycle, menstrual pain and shorter that normal menstrual period. The present day lifestyle changes have lately been the cause for weak uterus and declining fertility rate in young women. Similarly, women in their menopause also face numerous strange problems due to the weakened uterus. Use of natural home remedies has been the latest trend to strengthen the uterus and boost fertility. Here some natural home remedies to strengthen the uterus and maintain its overall health. 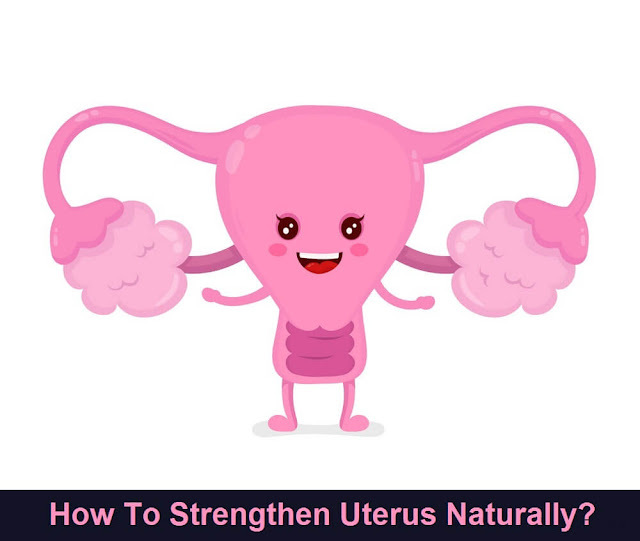 How To Strengthen Uterus Naturally? Make a fine and smooth powder. Take ½ tsp along with water thrice a day. This is a highly beneficial and trial treatment to strengthen uterus and helps to conceive fast. Make a fine and smooth powder. Take 1 tsp along with water after breakfast in the morning and 1 teaspoon after dinner at night for 60 days. This is the most effective and natural way to cure uterine weakness, leucorrhea, tumors and menorrhagia without any side effects. First Make a fine and smooth powder of herbs and then mix both kushta. Take ½ tsp along with lukewarm milk on an empty stomach in the morning and in the evening. Avoid hot and spicy foods. This remedy is highly beneficial in dealing with uterus weakness. Make a fine and smooth powder. Take 1 tsp along with water or milk before going to sleep. This natural remedy really provides nourishment to the uterus and aids the chances of conception. Add fresh emblica gooseberries and sufficient quantity of water in a non metallic pot. Next day remove water and put fresh water do it 3 consecutive days. On the 4th day remove water and again put 1 litre fresh water in amla now boil on a low flame until fully cooked. Let it cool now remove seeds add loaf sugar again cook until thick now let it cool and mix coarsely crushed barberries with amla mixture and save in a mason glass jar. Take 1tablespoon along with lukewarm milk an hour before breakfast in the morning and 1 tablespoon an hour before dinner at night. Consume roasted grams, red beans, grams stock, green grams and Avoid hot and spicy foods during treatment. This is a highly beneficial and trial prescription to treat uterus weakness fast. First Make a fine and smooth powder of herbs and then mix kushta. Take 1 gm along with water an hour before each meal thrice a day. This natural remedy is highly effective to cure uterus weakness and makes the uterus as strong to conceive fast. Make fine and smooth powder all herbs. Now fill in 500 milligrams capsules take one capsule along with lukewarm milk in morning and at evening. This is a good remedy for maintaining the overall health of your uterus and also cures all uterus problems. Make fine and smooth powder take 8 gm along with lukewarm milk on an empty stomach in the morning and at evening. This is one of the best home remedies to cure uterus weakness and helps to make strong uterus for conceiving. Make fine and smooth powder take 1 gm along with fresh water thrice a day. This remedy is highly beneficial to strengthen uterus. Make fine and smooth powder take 10 gm along with cow‘s milk for one week continually after menses. It promotes uterus strength and helps to conceive fast. Wash thoroughly and remove dust particles from sesame seeds now grind well with barley. Strain and mix loaf sugar in this mixture now store it. Take ½ teaspoon of this mixture along with honey in the morning on an empty stomach. It makes the uterus strong and healthy. Take this mixture along with lukewarm milk twice a day for 3 days regularly. This remedy will be quite beneficial for strong and healthy uterus. Make fine and smooth powder of all take 4 grains in summer and 8 grains in winter along with ½ kg milk. Also have apple and carrot murabba during treatment. This remedy greatly helps to provide relief from all chronic uterus problems completely. Make fine and smooth powder of above add Kushta faulad to make pills in jojoba size. Take 1 tablet 4 times a day along with cow’s milk.This natural remedy is very useful to tone and strengthens the uterus for conception. Steep red clover dried root in a cup of boiling water for 10-15 mints and take thrice a day. Red clover is a nourishing herb and one of the best blood purifying herbs. It is high in vitamins and minerals both calcium and magnesium, essential for proper and smooth function of uterine muscles. It also supports proper uterine tissue formation.